California unions are fighting to defeat Proposition 6 on the November ballot, an anti-union measure that ends critical funding to repair California’s aging roads, bridges and highways. The California Labor Federation and the State Building and Construction Trades Council of California – along with unions including the California Professional Firefighters, California Association of Highway Patrolmen and American Society of Civil Engineers – are helping to lead a broad coalition of union, business and environmental groups working to protect SB 1, the Road Repair and Accountability Act passed in 2017. SB 1 raises more than $5.2 billion annually through an increase in the state’s gasoline and diesel taxes. Passage of Proposition 6 would repeal that funding, ending vital repair work that has already begun and slashing middle-class jobs associated with the work. A recent report by a Washington, D.C. transportation organization found that across the state, more than two-thirds of major locally and state-maintained roads are in poor or mediocre condition and 1,603 of 25,657 locally and state-maintained bridges (20 feet or longer) are structurally deficient. The report also found driving on deteriorated roads costs California motorists a total of $22.1 billion each year in extra vehicle operating costs, an average of $843 per driver. These costs include accelerated vehicle depreciation, additional repair costs, and increased fuel consumption and tire wear. Protecting funding to help California grow and prosper is a Labor priority for the fall election. It’s up to working people to stand together and vigorously defend this investment in necessary infrastructure that keeps our families safe and creates more good, union jobs. What is Prop 6? It’s a repeal of the Road Repair and Accountability Act (SB 1), passed last year by the legislature and signed by Gov. Brown. The bill provided funding to thousands of critical transportation infrastructure projects with every single county in California receiving investment. It’s creating many good, middle-class jobs. Who’s against Prop 6? In addition to the Labor Fed, State Building and Construction Trades and unions across the state, the coalition includes business groups, local governments, public safety groups, the League of Women Voters and the NAACP. Who supports Prop 6? Remember Carl DeMaio? He’s the anti-union activist who has led multiple campaigns against union workers’ pensions. DeMaio is the chief proponent. Republican gubernatorial candidate John Cox and the California GOP are also backing the measure in an effort to make it a wedge issue this fall that drives Republican voters to the polls. Why does it matter? Prop. 6 would eliminate funding for more than 6,500 bridge and road safety, transportation and public transit improvement projects currently underway throughout California. It would also set the terrible precedent of repealing much-needed revenue that protects our families and creates good-paying jobs. To find out more, visit the campaign website at www.noprop6.com. 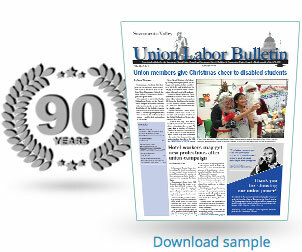 Parts of this article written by Steve Smith and reprinted with permission from the California Labor Federation.